Google Apps is the best available for businesses to create the domain specific email addresses. With Google apps, you can create the business email address such as info@domain.com, dharmendra@domain.com. this make your business email addresses professional as well as you powerful features of gmail and business apps, this is an important step. Today I have few Google apps vouchers that will help you save money on your Google Apps account purchases. Using these voucher codes for Google Apps for Work, you will be able to get the discount on your purchase. 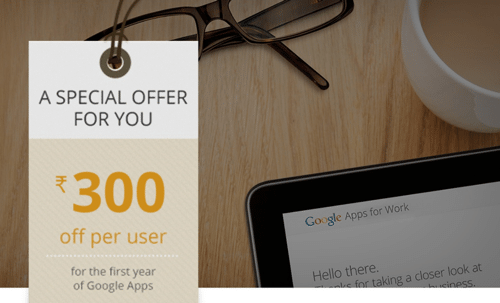 Here I’m sharing two unique Google apps vouchers that are valid till 31st July 2015, and this will get you the discount of INR300 off/user for the first year. In the promo code field, use any of the below-given vouchers. These promo codes are valid till 30th June 2016, so make sure you make most out of it. I will keep updating these Google apps deal with latest vouchers and working coupons. For now, don’t forget to share this deal with your other business friends on Facebook and LinkedIn.